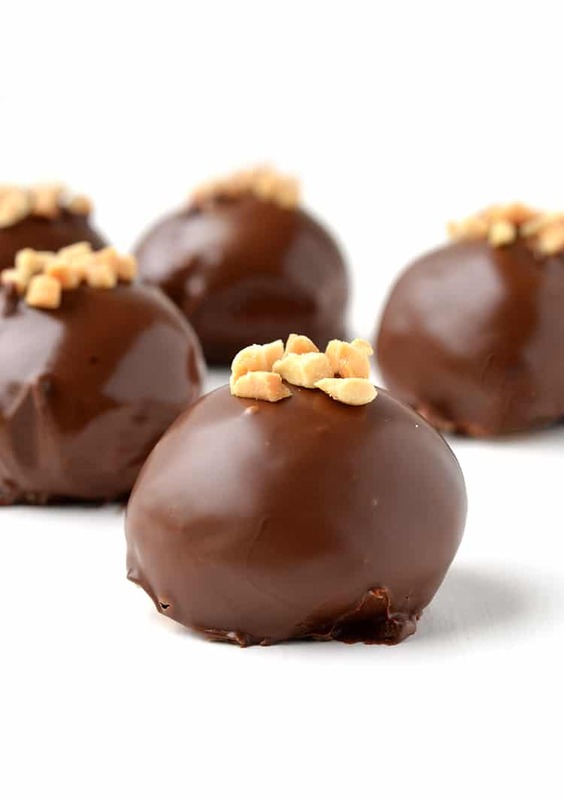 Caramel + chocolate = truffle HEAVEN. 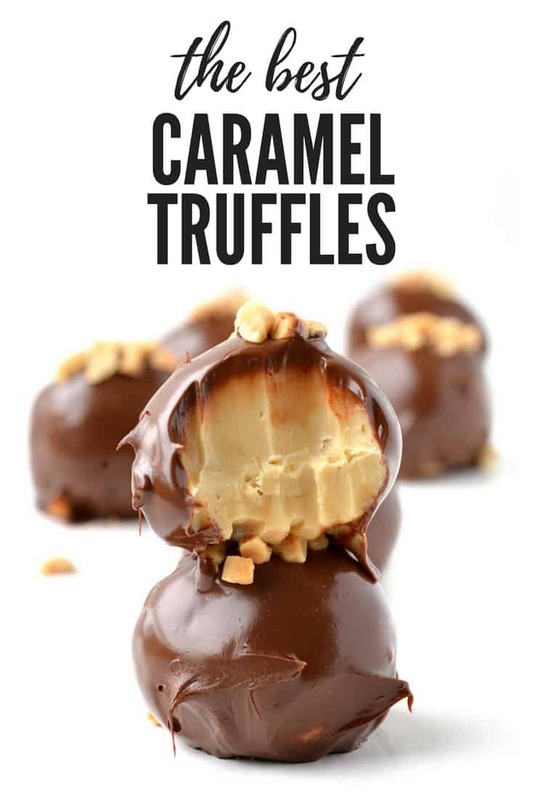 You’re going to LOVE these gorgeous caramel fudge truffles that – wait for it – are made in the microwave! That’s right! No stove top, no oven, just a bowl, a spoon and a microwave. So what are you waiting for? 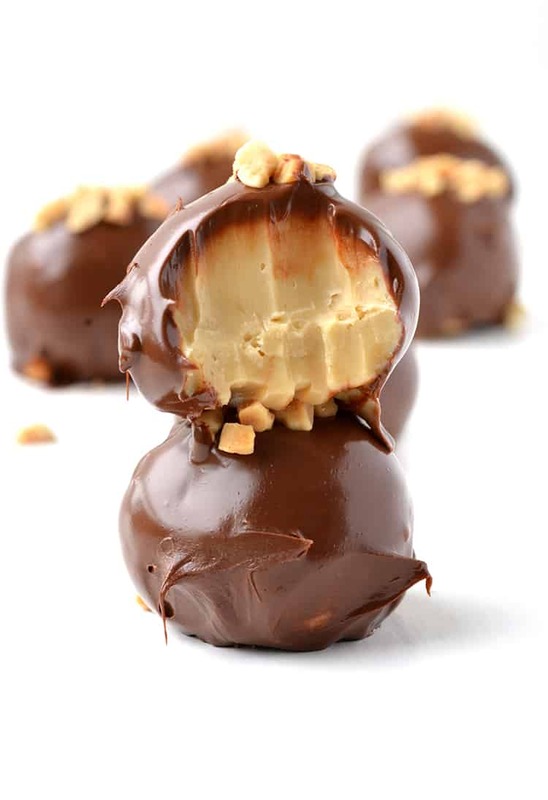 Let’s make 6 ingredient chocolate caramel truffles. I love caramel. (Remember these? And these?) Especially salted caramel. So these 👆🏻 Salted Caramel Fudge Truffles are my EVERYTHING. 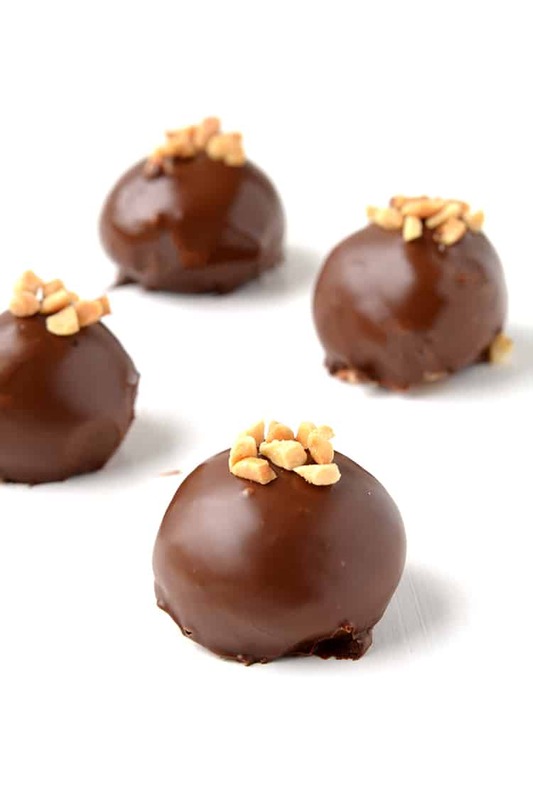 For a little decoration, I sprinkled each truffle with crushed peanuts but that is entirely up to you. You could leave them as they are, top them with sprinkles or drizzle with white chocolate. 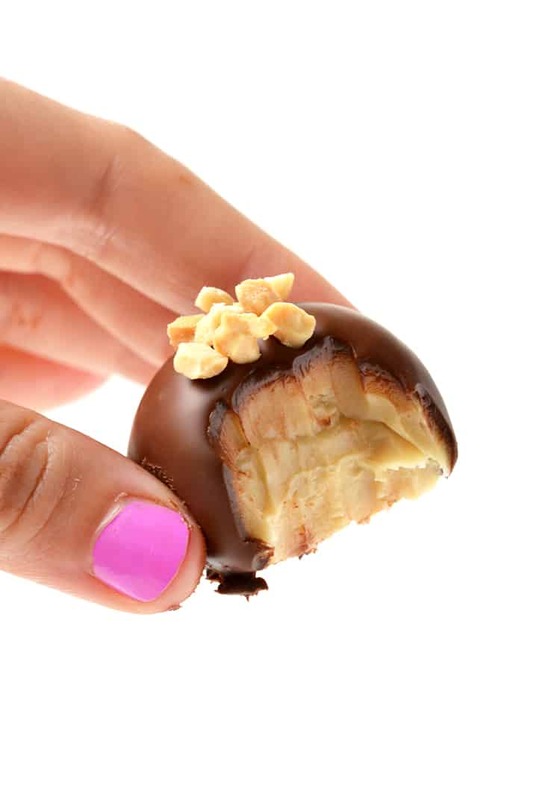 Whatever you do, you know you are going to enjoy one AMAZING caramel truffle. And nobody will guess just how easy these are to make! Shhh…it can be our little secret! These Caramel Fudge Truffles do come with a warning though. They are a-d-d-i-c-t-i-v-e. So make them when you are having friends over for a sweet snack or bite-sized dessert. On an unrelated note, has anyone had a candle explode before? I was cooking dinner last night and had a candle lit but it was getting close to the bottom of the wick. Then out of nowhere – BAM. The whole candle broke into about 4 pieces, while still lit, creating a total fire hazard and marking my wooden table for good. My, oh, my, I had no idea candles were such a dangerous household item! 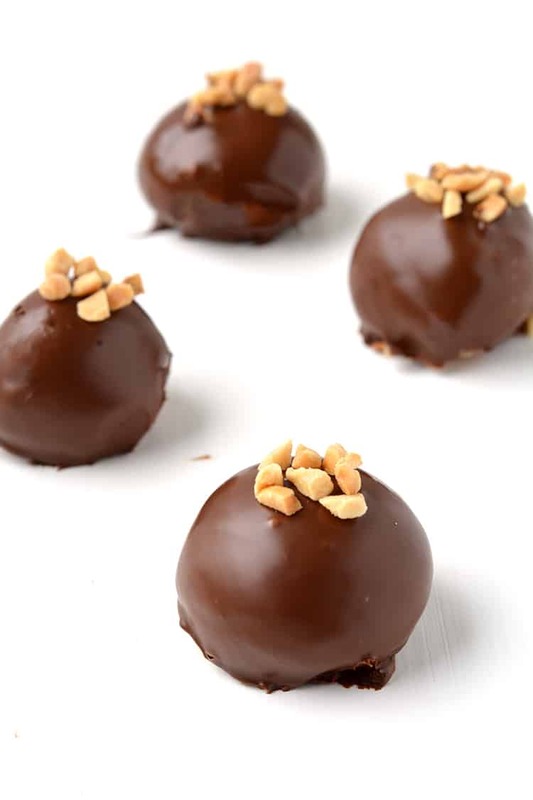 Easy, fudgy caramel truffles coated in dark chocolate. In a medium microwave-safe bowl, add the butter, condensed milk and brown sugar. Heat in the microwave for approximately 2 minutes, stirring every 30 seconds. Then heat in the microwave for 1 minute. Give the caramel fudge a good stir, then add in the white chocolate. Stir until the chocolate has melted and mixture is smooth. Stir in sea salt. Cover mixture with plastic wrap and place in the fridge for at least 3-4 hours or until firm. Leave the caramel fudge at room temperature for 10 minutes. Meanwhile, melt the dark chocolate in the microwave, stirring every 30 seconds, until melted and smooth. 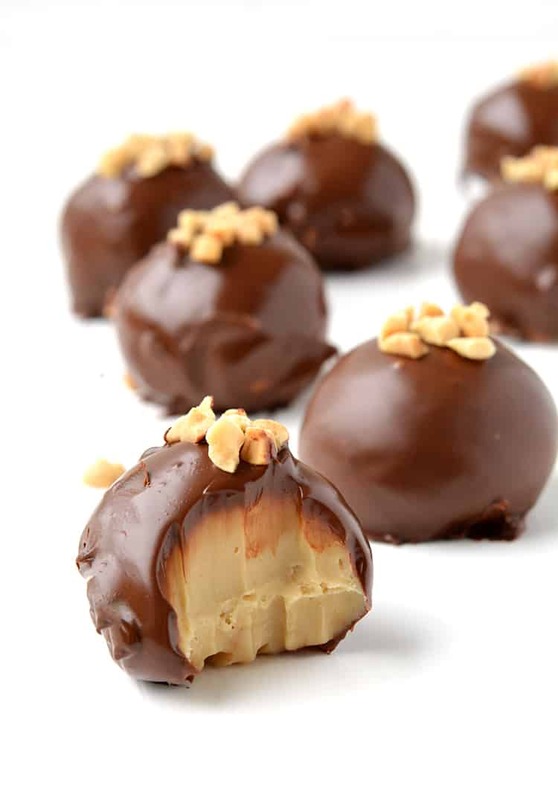 Scoop out tablespoons of the caramel fudge and roll into a ball using your hands. Dip each ball into the melted dark chocolate. Use a fork to scoop out the ball and place on an oven tray lined with baking paper. Repeat with remaining caramel fudge truffles. Top each truffle with crushed nuts (if using). Store truffles in the fridge. Hi, I am going to make these but I was wondering which type of brown sugar to use? It was very delicious !! What did I do wrong every time I try to make a round ball out of this it just goes flat before I c an even dip them? Hi Pam, it sounds like your Fudge hasn’t quite set. Try leaving it in the fridge or even the freezer for a bit longer. I haven`t use microwave for such thing Like truffles snd cookies and my microwave have diferent temperature seting: defrost low medium high. On which temperature do You Heat You truffles? Hi Marina, that’s a great question. My microwave is 900W and I have it on the highest setting. Depending on the power of your microwave, I would suggest medium/high. Alternatively, you can make the caramel on the stove if you feel more comfortable. Just heat the ingredients on a medium-high heat for 4-5 minutes or until thickened. Hope that helps! I have not made yet but when I do I.thought to use honey comb crushed on the top. I’m very keen to make these. As I think they’d make a lovely gift. Hi Karen, ooh crushed honeycomb on top sounds like a wonderful idea. They would make for a lovely gift – especially for Christmas. Hope you enjoy them! Love hearing that Josh! Thanks for the lovely feedback. I could not get these thick enough to roll into balls. They are delicious but I had to put them in chocolate coated pan and cover them with chocolate: What did I do wrong? Hi Jan, I’m sorry to hear that! I haven’t had this problem myself. Did you use all the ingredients as specified and leave it to set for 3-4 hours? Perhaps next time you can heat the caramel for a little bit longer in the microwave to ensure it sets. Do you have a stovetop version of this? They look amazing and I’d love to try!! However, we threw out the microwave and only use the stove. Thanks!!! 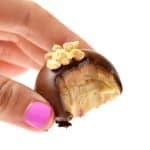 Can you use caramel as the topping instead of chocolate? And please forgive me if my spelling is off. Hi Ella, thanks for your comment. I’m not sure what kind of caramel you mean but I don’t think caramel would harden like chocolate does. Chocolate and caramel also go so well together! I hope you enjoy them. Thanks, I might even try it with both! I hope that I can make them just perfect though! Have a great day!!! Hi Priyanka, thanks for your comment. You can store these in an airtight container in the fridge for up to 5 days. Do u have to use dark chocolate? Hi Robin, not at all, you could use any chocolate you like, milk chocolate or white chocolate. I just like dark chocolate for the contrast because the filling is quite sweet. I hope you enjoy them! What a beautiful texture to the filling! 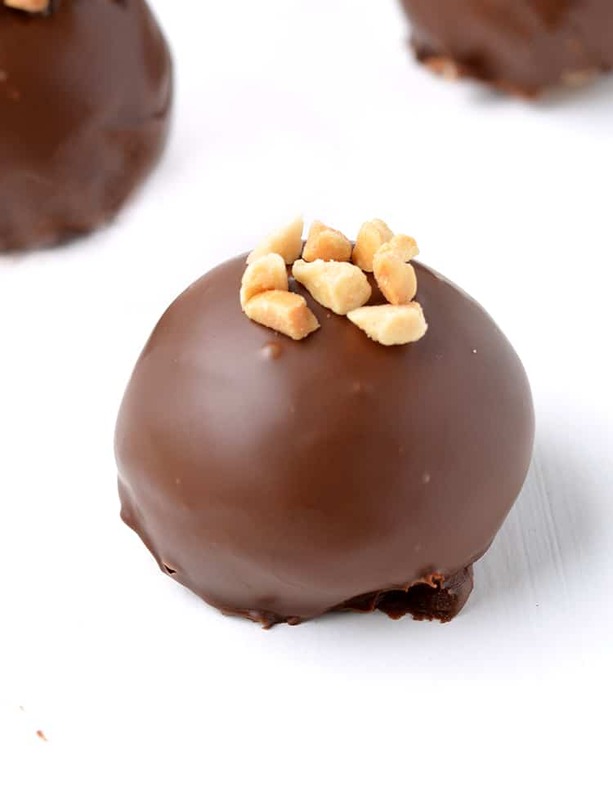 These fudge truffles look so chocolatey and delicious!